March 1, 2018 by Applewood Seed Co. Here at Applewood Seed Company we create flower seed mixes to fit various applications and uses. For example, these include mixes for ornamental purposes, pollinator conservation, wildlife plantings, garden flowers, xeriscaping, and for various geographic regions. These mixes come from years of experience testing individual species and mixes in our trial gardens. Experience makes a difference! Therefore, we believe you will find our mixes to be of high quality and to be well-suited to the intended application. 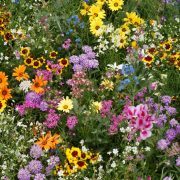 The majority of our mixes are a blend of annual and perennial flowers which contain early, mid-, and late blooming flowers. Additionally, these mixes provide color throughout the season. The species are balanced according to seed size, plant size and aggressiveness. We create flower seed mixes on site and then store them in our climate-controlled warehouse, ensuring a high quality product. Because the mixes contain primarily open-pollinated flowers, they provide nectar and pollen for any pollinators that happen to take an interest in the wildflowers. 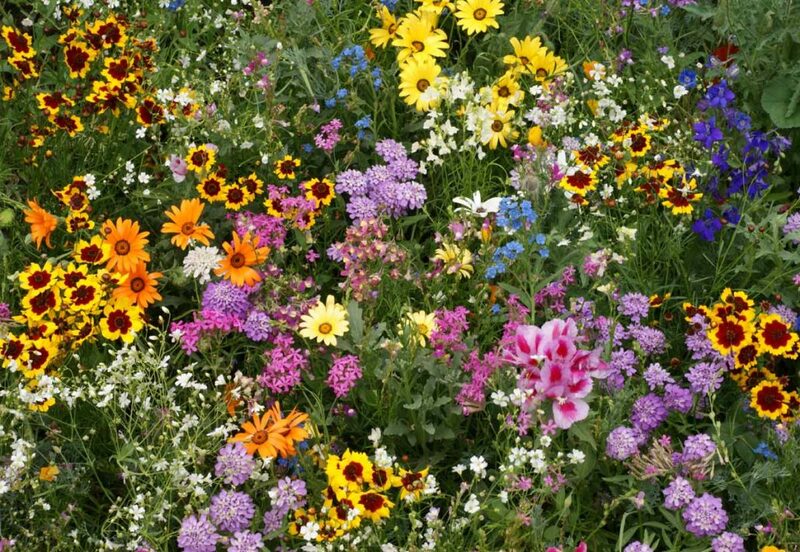 In the first year of sowing a mix, the annuals will bloom and act as a nurse crop to the slower growing perennials. Perennials establish their root structure the first year. You might overlook the perennials this first season as most only produce leaves. (Therefore, make sure you don’t “weed out” everything that is not blooming; you will lose your perennial bloom for future years!) As the annuals finish blooming, it is best to let them go to seed, enabling them to reseed themselves for a second year of blooming. While the wildflower mix springs into its second year of life, the perennials will now bloom along with the reseeded annuals to provide an aesthetic and colorful display. Please feel free to look through the photos of all our flower mixes here on our website. And if you have any to share, we would love to see them!